DutchCrafters solid pine wood furniture offers an affordable wood furniture solution to purchasing handcrafted American made furniture for your home or business. This short FAQ video will provide some interesting information about this unique furniture type, as well as some pros & cons that go along with owning pinewood furniture. Shop our collection of country style furniture or cottage style furniture today. We have something for every room of your house. Since 2003, DutchCrafters has been a pioneer in bringing Amish furniture to homes and businesses across America through web-based sales. We pride ourselves on both the superior quality of our Amish furniture and our superior customization process and customer service, which is why we’re continuously ranked A+ by the BBB. Give us a call at 866-272-6773 to speak with a friendly furniture specialist. We’ll be happy to send you stain samples and assist you with questions. You can order today with just 30% down. The DutchCrafters store in Sarasota, Fla. showcases popular Amish furniture and provides the opportunity to speak in person with a furniture specialist and compare wood finish and fabric samples. You may be asking, is pine furniture right for me? Well, let’s look at some of the pros and cons of indoor pine wood furniture. The first thing you’ll notice with Pine is the customer-friendly price. Your pine options will always be available at a lower price point than hardwoods. You see, Pine is a soft wood, unlike Oak, Cherry, and Walnut. While this soft wood will wear more easily, those dents and nicks can create character and don’t affect the function or stability of the furniture. It’s still custom furniture made in America, but at a more affordable price. Additionally, many of our pine products are available as quick-ship. These products are pre-built but will still be finished with the stain or paint of your choice before shipping out. Pine is a light-colored wood with little visible grain. It takes paint very well, making paint a popular finish. You can expect a focus on high-quality finishing on your pine furniture, often with distressed and hand-rubbed options available. Pine wood often carries sap in channels through the wood, which is invisible at the time of finishing. Months after you get your piece, if it’s stained or painted a light color, the yellowish sap may appear in random streaks on your piece and bleed through the finish. For this reason, we recommend dark paint on pine. If you insist on a light color, just know that you may be looking to re-paint it after a couple years to cover up the sap streaks. Pine features many knots. Depending on the piece, your woodworker may select knot-free boards for the most visible parts of the piece, but you can expect knots on the sides and backs, and occasionally throughout. Pine furniture is typically considered country or cottage style due to the simple designs, knotty wood, and distressed finishes popular in the pieces. It’s nearly impossible to match the finish of a pine piece to a hardwood piece already in your home, but with the right finish a pine storage piece can be an excellent accent to your hardwoods. Due to the relative softness, pine may not be the best choice for pieces that receive a lot of wear, such as chairs, table tops, and desks. However, it’s a great choice for hutches, pie safes, entertainment centers, trash bins, and other storage pieces. We also offer many outdoor pine furniture pieces, which have similar characteristics to indoor pine. So, are you looking for quality, custom storage or accent furniture at the most affordable price? Want a painted piece with a country look? Pine is a great option for you. Do you intend to use it heavily? Want it to maintain that “brand new” fine furniture luster as long as possible? Maybe a hard wood like brown maple would better suit your needs. What do you think? 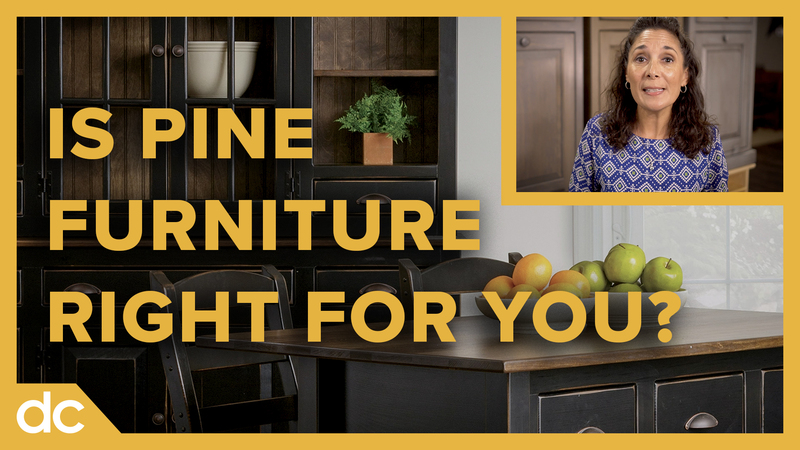 Is pine right for you? FAQ: What Upholstery Should I Choose for my Furniture?